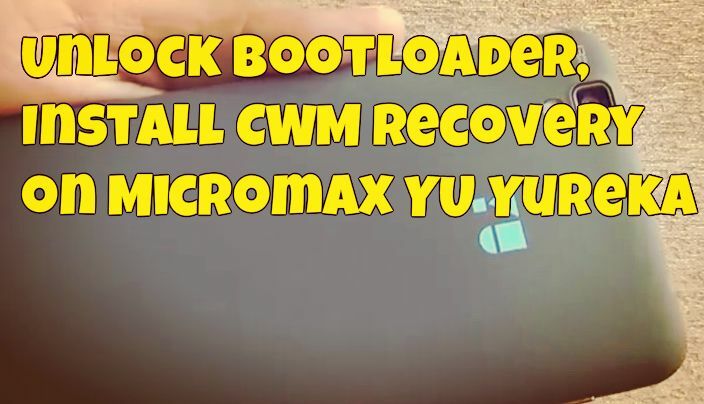 Micromax YU Yureka is already released in india and most of the users are looking for the way to unlock the bootloader and Install CWM recovery. To get the root access on the YU Yureka you need to unlock the bootloader and install recovery first. Here in this guide we’ll show you how you can do this in easier way. All you need a Windows PC and USB cable to get started. Al credit goes to the XDA member vishal_android freak, who comes with this guide and managed to create a custom version of ClockworkMod recovery and root the device. If you are the Micromax YU Yureka users and want to do the same on your phone, read all the instruction very carefully and follow all the steps one by one on your device. Note – This will wipe all your data and Format Internal memory ! So keep a backup ! Step 1. Download the file ADB _Fastboot.zip and extract it to a folder on your desktop. Switch off your Micromax Yureka Android smartphone. Step 2. Now connect your to the PC with USB cable and the LED near the speaker at the top goes red. Step 3. As soon as the LED glows keep the vol up button pressed. You will see the fastboot screen. Step 4. At this time open the command prompt windows on your ADB Fastboot folder. Hold Shift button and right click on the empty space of the folder and select “Open Command prompt window here”. Step 5. Now in the command prompt window type the following command. Step 6. Now the next step is to install the CWM recovery. Download the CWM recovery here and save it on your ADB Fastboot folder. You have successfully Install cwm recovery now ! Just press Volume up + Volume down + Power button to access CWM mode ! How to backup the whole internal memory?I have installed some nice apps with data downloaded and don’t like to lose them.Pls guide me.